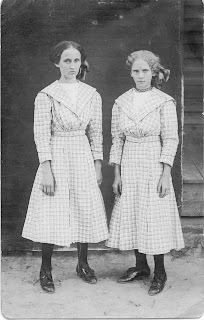 Sarah Lucinda Taylor, born February 4, 1900, and Ausie Elizabeth Tayor, January 26, 1902, were the daughters born to Alonzo Grant and Margaret (Stephens/Stevens) Taylor. Alonzo and Margaret also had five other children born after the girls. The family lived in Ashridge, Alabama in Winston County. Their home was located near Liberty Grove Baptist Church. Sarah Lucinda was named after her maternal grandmother, Lucinda (Brown) Stevens. She was fondly called "Lucindy." She married Jasper Monroe King. After his death in 1962, she married Verdie Davis. Lucindy had no children. She lived to be 90 years old. Lucindy is buried at Liberty Grove. Ausie Elizabeth married James Wesley Knight on September 15, 1920. They had 7 children: Eugene, Auzeline, John, Patricia, Joe, Carlene Eric, Wynema. She died at the age of 95 years old.